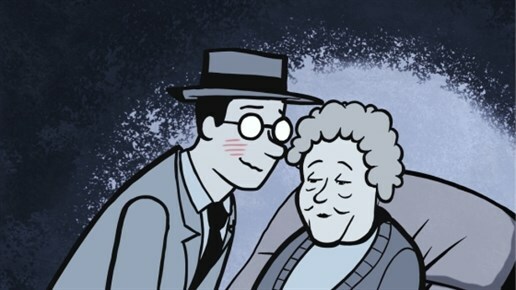 Seth has become a prolific face of Canadian comic art; a face that connects a glasses and top hat-donned head to a trench coat-covered body with a tie. The Drawn & Quarterly darling is known for his comics, graphic novels, cardboard city Dominion and recent illustration work with Lemony Snicket. Seth’s Dominion captures the man’s nostalgic personality from the shots of him discussing himself under a warm golden spotlight, his pretend old-timey video footage of walking along train tracks and through the woods, him acting out handmade puppet-like plays and animated shorts of his stories. Each part is cinematically beautiful, and brings fresh life to his work, but combined it does leave a slight sense that he directed the documentary on himself, not someone else. “There’s something really valuable about doing art for yourself,” he says. Fair enough. Seth draws lines between his work processes and his inspirations. He’s been fixated on telling his parents’ stories besides his own. His childhood has made a big visual and emotional impact on him. “Memory is a blueprint of sensation,” he says. It’s clear he’s a very sensitive person, which is good for a skilled storyteller. As he’s grown, he’s made his environment his art project – he’s made everything around him into something special, including his wife’s barber shop. If you haven’t checked out any of Seth’s work yet, you will want to by the end of this documentary.